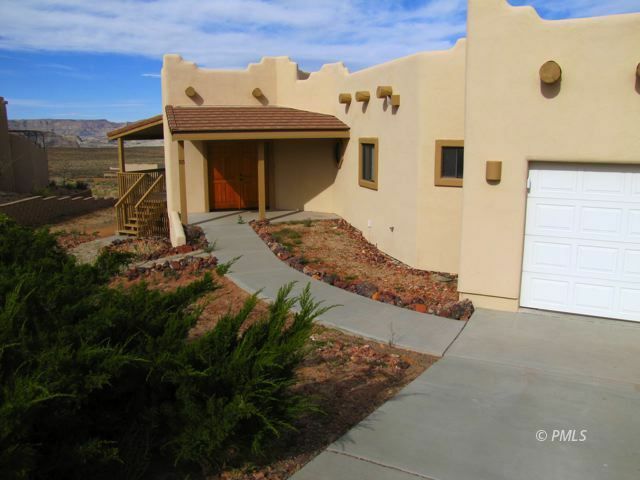 Beautiful single level three bedroom, two and half bath 1930 SF stucco home with .51 acres located in a very nice neighborhood is ready for you to move in. This popular model gives wide open rooms and many windows that provide views of Lake Powell and the Kapairowits Plateau as well as provide natural light in the home.. The propane fireplace in the living room is not only beautiful but is a bonus to the heat pump used for heating and cooling. The wrap around Trex deck is another plus and will provide a perfect spot to watch Lake Powell sunrises. There is a very large laundry with a half bath as well as a double car garage. The desert landscaping allows you more LAKE TIME. THIS HOME IS BEING SOLD WITH ATTACHED LOT (52 Lake View) so you can have a BIG back yard or build another garage. The choice is yours.. THERE IS A NEW WATER HEATER, NEW HVAC, Painted Inside and Outside within the past two years AND NEW CARPETING IN THE LIVING, DINING AND MASTER BEDROOM. Give us a call and we will be glad to provide you with a personal showing.